I've been busy reorganizing and putting my beads into Bead Towers. Those that fit will travel with me if we have to evacuate for a hurricane this summer. I found a brooch I bought in Tuscon 6 or 7 years ago to use in a Touch of Russian Elegance necklace. I got side tracked after finding my beads so neatly stacked in the towers I printed out the pattern. It turned out the brooch was not the perfect fit for the necklace. The instructions include beading around a 27mm rivoli which I had in black. 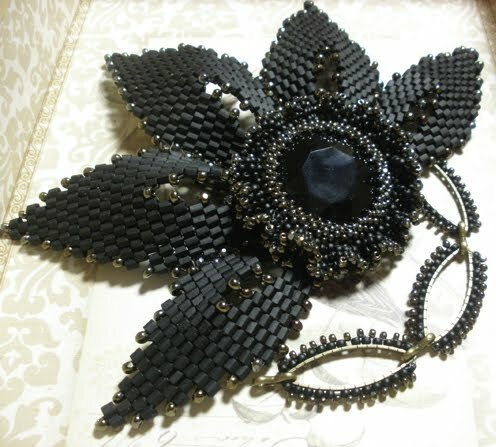 I used 11-cut bronze iris seed beads to accent the crystal and the ruffle. If you would like to create your own Touch of Russian Elegance the pattern can be purchased here. Sometimes black just says it all...I love this one. A little black dress and shoes would set this off perfectly. If only I could wear one...lol! I love the metal link pieces in the beaded chain. 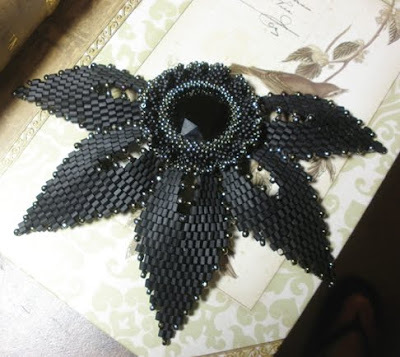 It's so nice to see structural elements like that in beadwork. Rosanne if we both could wear one we would get into trouble!! Kate thanks for stopping by and the kind words. Love it! Dramatic and elegant.